When we arrived to the airport in Cancun a few years back for a family vacation, with our then 2-year old and our 6-month old, I thought I had packed everything. I had the stroller, car seat, the compact high-chair thing, the pack-n-play, the BabyBjorn carrier and smaller accessories I could fit into my suitcase. However, at the car rental place at the airport, the smile on my face quickly dissolved and turned into panic when I noticed that I had forgotten the ‘base’ to the car seat. At that moment in time, it would have been ideal to just have all of the gear pre-ordered and ready for our arrival or waiting for us in the hotel. Traveling with kids can be stressful enough and well, let’s face it, there are a lot more glamorous (and fun) activities to do than schlepping around a ton of baby gear through an airport. The idea of extra fees, lugging, checking, claiming and setting up and then doing it all over again can leave anyone exhausted even before checking into a hotel (or even just thinking about it). But you don’t want to sacrifice your kid’s safety or comfort. 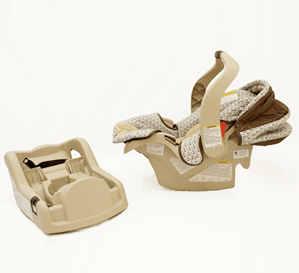 The company offers a dream inventory of safety-approved, top-notch, quality items on the go for babies and toddlers including small to large gear and accessories for sleeping, schlepping, swimming, bathing, eating, strolling, running, corralling, playing, reading, potty training and more. The icing? The prices are affordable. For example, an Exersaucer or Graco swing with a musical mobile will set you back a whopping $5 a day, a play yard $6 per day or a high chair at $7 a day. 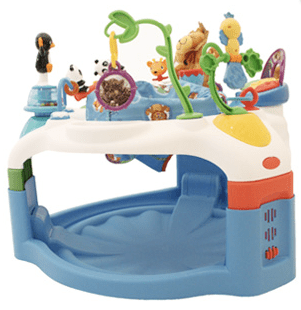 Inventory items include a portable toddler beds, Pack-n-Plays, lightweight or mid-sized strollers to double strollers, joggers, car seats, gliders, humidifiers, baby gyms, toys and much more. I was so intrigued with the company and concept, I decided to interview Baja Baby Gear’s owner and visionary, Jenni Reichert. When I was planning our Christmas vacation to Texas, I was panicking about all the things that Wyatt (my son) needed while we were away. I didn’t want to pile all his things into our luggage (wouldn’t have gotten it all in anyway!!) and I didn’t want to buy everything brand new as it wouldn’t have been fair to my in-laws to have to store it all. A baby equipment rental company came up after a Google search and I immediately had the ‘Aha’ moment… I searched for the same type of company in Cabo – couldn’t find one… and that’s when the idea came about. Our son Wyatt was a big reason for my opening the company also – I wanted to stay at home with him, but I needed to bring in an income also. So, this is the best of both worlds. I do plan to have more children soon, so having a business that I can run from home is really a dream. The company was launched mid February 2011. I got the idea over the Christmas vacation time, wrote the business plan on New Year’s Day and was ready with all my equipment etc. by February. Baja Baby Gear is a Mexican company. Baja hosts thousands of families every year who are in dire need of this kind of service. The Baja is also my home…. so it is a good place to start the business. Do you live in Baja? If so, where are you from originally? Yes, I live in Cabo San Lucas. I have lived here for more than two and a half years. Before Cabo, I lived in Puerto Vallarta for six years. Before that, a brief stint in Mazatlan for a little over a year. I am from Northern Ireland originally! I am actually a licensed beauty/massage therapist by trade, although I haven’t practiced at all in Mexico. I worked for a vacation ownership company in sales and administration throughout my time here. Yes, the business is 100% mine. Of course, if I am out of town or I have a lot of orders, my husband happily helps with deliveries, or looking after Wyatt! Will you expand into other cities in Mexico, could this be a franchise? I would definitely consider expansion. 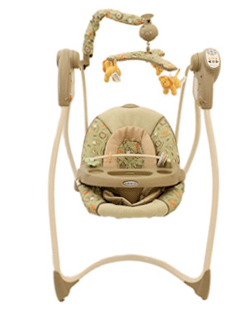 I would like to get Baja Baby Gear on a steady path first and then see where it could lead. I have had a few requests for Mexico City … so you never know! Can you meet people at the airport to deliver items? Or do you meet them at the hotel, rental house or villa? For a $25 USD surcharge, I can meet clients at the airport. I deliver and pick-up anywhere really. If the order is for over $100 USD, it is free delivery and pick-up. If it is under $100 USD, there is a $25 USD delivery/pick-up fee. I am as flexible as I can be when it comes to delivery / pick-up as I know these are the most stressful days of the trip. With that said, I frequently liaise with concierge or the bell boys to hold on to the equipment on behalf of the client, so they don’t have to meet with me personally if they don’t have the time to. If the clients are staying in a private home, I am happy to deliver/pick up from them directly. If the booking comes through a local travel agent, I am also happy to have a representative come get everything from me, so they avoid any delivery fees! I have even been known to meet clients on the highway, who are en-route to their destinations outside of the Cabo area! Do the renters just leave all the equipment in the room or take them all to the lobby the last day or do you pick up all the stuff the last day? The clients will ultimately either meet me personally to drop everything off, or they will give it all to the bell boys to hold, so I don’t have to go to their rooms to remove it. Do your items have safety ratings? What is your cleaning or sterilization process? I clean and sterilize all equipment between uses. I use various different methods, depending on the material type… but typically, all equipment is steam cleaned. Any materials are machine washed with baby-friendly detergent. All items are rinsed down with Lysol after they have been cleaned and upon delivery, they are actually given a second wipe-down in front of the client or hotel representative. What is your process for updating or replacing your gear or staying active on recalls? I belong to an association called Baby Travel Pros, which is a way of keeping up to date on recalls. 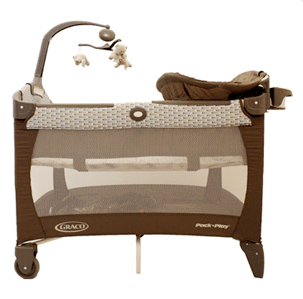 I also follow all the brand websites, (Graco, etc) weekly. The JPMA website is a great source for recall info. I haven’t had to replace any of my equipment yet, as it is all brand new! However, it will be evident to me as and when it happens. I have a fantastic shipping company who can ship me replacements from the states quickly. How is business? Have you seen a demand? Business has been busy from the day I launched. Things slowed down a little in July, but there is a steady demand. Most of the business is very last-minute or with a week or two in advance. I am starting to get orders in advance though… which is great! How are people discovering you? Through word-of-mouth, referrals, social media? Word of mouth…I am active in the community… I have my Facebook and Twitter accounts, I advertise in the local Gringo Gazette, Cabo Social magazine and of course my website. I have started to get referral business now also… which I am thrilled about. 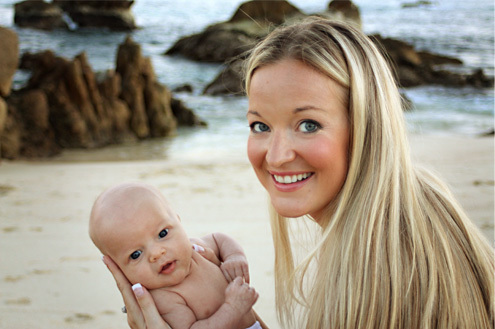 Baja Baby Gear also has a helpful website including links to personally recommended babysitters and pediatricians in the area and includes an informative blog for parents living or traveling around the Cabo area. Visit http://www.bajababygear.com for more info or visit her Facebook page. All photos used with permission, credit by Sara Richardson. I love this! Would you know of a company that provides equipment rentals in Mexico City? 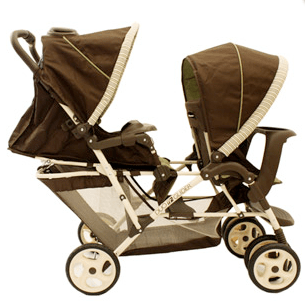 We would need a twin stroller as we will be in Mexico City 09/20-10/04. It’s a great article, Susie. And a much needed service in every Mexico tourist destination (except PV because there is PV Mamas). Keep up the good work with Mexico Today. Hi Sarah, thanks for the note. I’m looking into the ampi now and have edited it in the interim. Thanks for the feedback! Great article. I just wanted to let you know that my company, PV Mamas, is a family vacation services business that includes baby equipment rentals of all kinds, including jogging strollers. We also provide babysitting service, personal shopping, restaurant and activity recommendations for families and offer free delivery within the greater Puerto Vallarta area. Please check out our website at http://www.pvmamas.com. Sylvia!! Thank you so much for letting me know about your company and all the resources you provide. This will come in handy next time we are in PV!